A new note from the Octopath Traveler developers states that the game focused on three central elements: visuals, interactivity, and freedom. 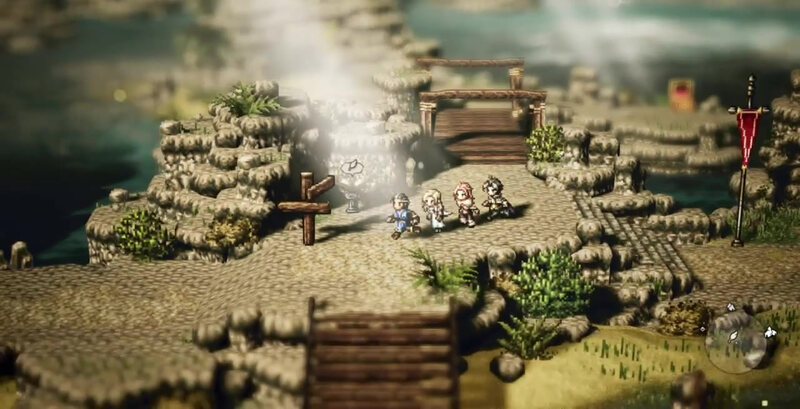 The game formerly known as Project Octopath Traveler had been steadily gaining buzz for months following an early demo that left many RPG fans eager to get their hands on the full adventure. Fortunately, enough time has passed since then, and Octopath Traveler is now available for Nintendo Switch owners to pick up and play to their hearts' content. Not only are fans happy, the developers are happy too: so happy, in fact, that Acquire's Keisuke Miyauchi and Square Enix's Masashi Takahashi recently posted a special note from the developers celebrating the game's release and providing more detail about the core concepts behind the title. "The first is the glorious visuals rendered in "HD-2D." We took inspiration from the pixel art of the RPGs we ourselves used to play, updating them with modern technology to create rich and varied landscapes that we believe players will find to be both nostalgic and freshly beautiful. "The second is the interactivity, with each character able to interact with the residents of Orsterra through their Path Actions. We hope you'll enjoy getting to know the people, with their sometimes tragic, sometimes heartwarming stories and pasts. Producer Masashi Takahashi also chimed in to say he's happy that Octopath Traveler has finally released, and that he hopes players will "enjoy talking to each other about how far along you've gotten, how you picked up certain powerful items along the way, and the like — just like the good old days of classic pixel art RPGs." Octopath Traveler certainly has an impressive amount of content on offer for players, and game fans who fondly remember the 16-bit era of Japanese role-playing games will feel right at home with the presentation, job system, and combat. To learn more about the latest Square Enix release, players are welcome to stop by our Octopath Traveler strategy and guide hub, which elaborates on the game's many interrelated mechanics and provides other helpful tips and trivia.